A Full-Featured Remote Control for only $329! The CircuitWerkes SiteSentry2 ushers in a new era of remote site monitoring. An internal Web server lets you monitor your site from any Web browser, anywhere in the world. Automatically detects both meter low and meter overload conditions on one, or both channels. An internal temperature sensor can respond to high or low temperature conditions. The external audio monitor meters two channels of audio and can respond if either silence or overload are detected. Not only are the SiteSentry series of remote controls great little stand-alone remote controls, they can also be used as a convenient way to add Web/network capabilities to your existing dial-up only remote control. If you have a dial-up remote control or a product where the Webserver is no longer supported, you don't have to get rid of your old hardware. Simply parallel the SiteSentry's metering inputs across the desired metering channels of your old remote control and also wire in the relay outputs in parallel, too. 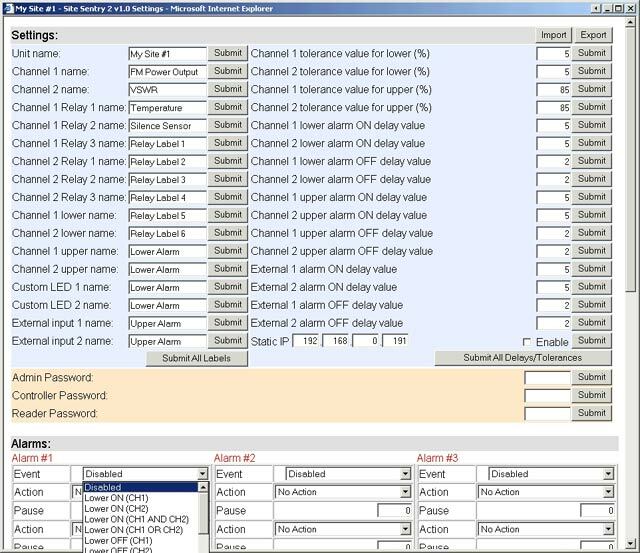 The SiteSentry will work in parallel with most older remote controls to provide a rich Web experience complete with independent alarm handler, NTP corrected real time clock and event scheduler, logging with emailing, and email/text message alarm notifications. Now you can upgrade your old remote control's capabilities for a fraction of the cost of replacing it. The SiteSentry series of controls do not use Java, ActiveX or any other proprietary software. Your SiteSentry unit will work on nearly every browser and across all major operating systems including Windows, Apple, Android and many others. Only one port is needed to access the Webserver. The SiteSentry2 gives you Web control of six relays (two are DPDT) that can be latching or momentary. Two status inputs give a visual indication, via the Web server, whenever triggered & can also activate automated relay actions. Use the SiteSentry2 anywhere that you need an inexpensive, network addressable, controller with status capabilities. Three levels of user control are available ranging from reader up to administrator. When meter-low, overload, or external status change, is detected, the SiteSentry2 can perform user-programmed, automated, sequences of actions and can also respond to user control via the network or via external contact closure inputs. Actions can be programmed to run once or to repeat while the condition exists. Alternate actions (or cancellation of previous actions) can be set to run when the conditions return to normal. Action sequences can also be run manually. The SiteSentry2 supports SMTP and can send both e-mails and SMS text (to your phone) messages that alert you of alarm conditions. E-mailing is accomplished directly from the SiteSentry2 hardware. The SiteSentry2 can also keep an onboard log and you can have that log emailed to you periodically. The SiteSentry2 supports dynamic IP redirect services like dyndns.org and no-ip.org. This allows you to use the SiteSentry2 on a dynamic IP instead of paying for a static IP. With DDNS, you can find your unit by name instead of by typing an IP number. All version of the SiteSentry2 can track time using an NST time sync but will continue to keep time even if no NST server is available. Manual time sync is also permitted. In addition, a 50 event scheduler is included with the streaming version of the SiteSentry2. The scheduler has a resolution of better than 1 second, so events can be scheduled at any second of any hour. Events can be set to repeat every day at a specific time for a month, then stop but to repeat again the next year (for AM station pattern/power changes. Onboard logs are kept at a user specified interval. Logs can be e-mailed at regular intervals. Logs can also be included with alarm e-mails, if desired. The log format is user-defined via a two-part template. The SiteSentry2 is field upgradable. When new features are added or when a bug is found, you can easily and safely upgrade the units in the field with the latest firmware through the Webserver. With free upgrades, you can always keep your SiteSentry2 up-to-date. Up to two SiteSentry2s can be optionally rack mounted in a single sized rack shelf. Administrators can perform all setup through the Webserver. 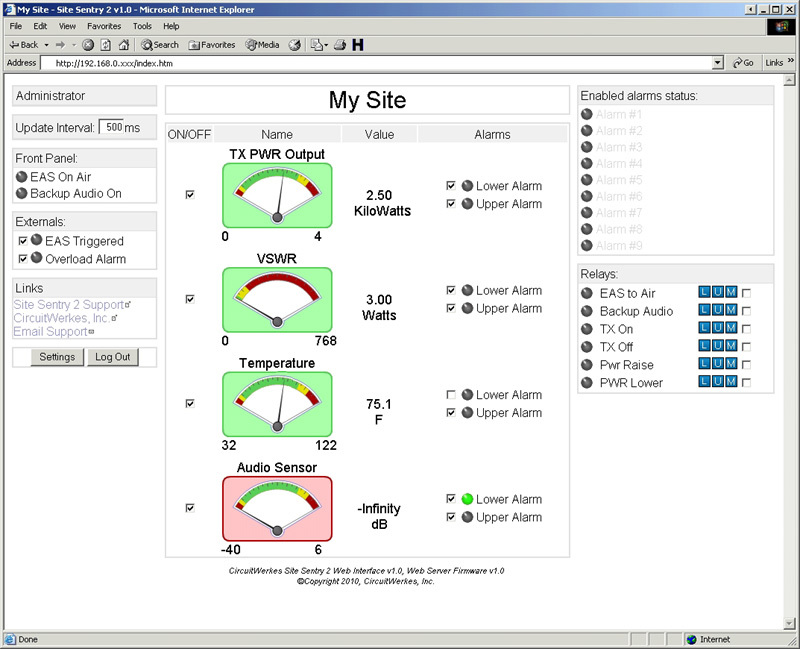 The SiteSentry2 includes free multi-site monitoring monitoring software. User settings & labels can be saved to the host computer and uploaded to the original SiteSentry2, or to others for mass programming. The "S" version of the SiteSentry2 (SiteSentry2s) includes the ability to decode Shoutcast/Icecast MP3 or Ogg-Vorbis audio streams. Stereo or mono streams are supported at bitrates up to 192kbs (no more than 128k is recommended due to an onboard buffer limit of 64k). Received audio streams may be routed through the DPDT relays for putting on the air as backup sources when a main audio failure is detected. The decoder mode includes station & song name decoding for Shoutcast as well as general stream information. The SiteSentry2 also includes the ability to encode Shoutcast/Icecast compatible audio streams using the open-source Ogg-Vorbis format. 10 different streaming profiles are included. Ogg-Vorbis can be decoded by virtually all media players and is a very robust and high quality alternative to mp3 encoding. The SiteSentry2 can be used to either encode or to decode audio streams. Because it is half duplex, the SiteSentry2 can not encode and decode at the same time. Switching between transmit and receive is a one-button click. The SiteSentry2 can be used as a stand alone streaming audio encoder or decoder with auxiliary relay outputs, however, the SiteSentry2 relays are not synchronized with the encoded audio. Audio in and out of the SiteSentry2 is unbalanced, stereo, on deplugabble screw terminals. > Internal Web Server lets you monitor your site from anywhere in the world. > Channel monitoring via meters and digital readout of values. > Send e-mail or SMS text messages directly from the device. > All configuration data can be stored locally on a PC for re-use later. Never lose your configuration data again! > Supports DDNS services from dyndns.org and no-ip.org. > Web server supports netbios names for easy location. > Fully Flash upgradeable. Upgrade your unit's firmware in the field to use newly released features. > Can be used as a Shoutcast/ Icecast compatible audio streamer with embedded relay closures (non-synced to the audio). > Onboard dual input audio monitor can detect silence or overload on stereo or mono systems. > Web interface knows when it has lost communications with the site and alerts you and tries to reconnect automatically. > On-board temperature sensor displays F or C.
> 16 user-definable alarm conditions can trigger up to 3 actions (from a pool of 68) per alarm. > Two external status inputs can activate user-defined actions. Inputs are optocoupled and triggered by grounding or by supplying a voltage (user configured). > Six independent relay outputs (4 SPST & 2 DPDT), controlled by action sequences or by user command. > Relays can be momentary or latching and can be disabled. > DHCP or Static IP capable. > Sends emails or text messages when alarms occur. > Keeps onboard logs that can be sent to your inbox via automatic e-mail. > Netbios name can be user changed. > Receive Shoutcast/Icecast Ogg-Vorbis or MP3 audio streams. > Transmit Shoutcast/Icecast Ogg-Vorbis audio streams. > Transmit audio streams with or without internal audio AGC. > Stereo, active, balanced audio inputs and balanced audio outputs. > Automatically switch between up to 5 different audio streams. > Displays stream statistics on the main webpage. > Includes RTC with 50 event scheduler. Above: The main operating screen for the SiteSentry2 with low audio level detected (red meter backgrounds).